Ultherapy basically uses ultrasound waves and energy produced by them, for treating the inner most layers of the skin. As a result of this treatment the skin becomes tight, firm, and gets a natural lift. It is becoming increasingly popular as the desired results are achieved without any disruption to the skin surface. Let’s find out the all we need to know Ultherapy. The body’s own ability to heal itself is the basis of this modern age treatment. It is executed without any surgery or invasion of the body at all. Most clients who opt for this treatment are looking to tighten the loose skin around the eye brows, neck and below the chin. It is a procedure completely approved by FDA. Client can see noticeable results immediately and they look completely natural, without any hint of a treatment. There is no need to wait for results, or use of any foreign substance or any change whatsoever. In very simple words the skin is given a boost from deep within, to create healthy effects on the outside. Patients can go about doing their daily activities after this 60-90 minute procedure. Over a period of time the cells will get renewed vigour from the boost. Patients have reported back stating that they have observed positive boost over a period of 2 to 3 months. In some cases enhanced results were seen up to 6 months too. It is a very safe and effective alternative for people who are reluctant to go for a surgery or are medically barred to get one. 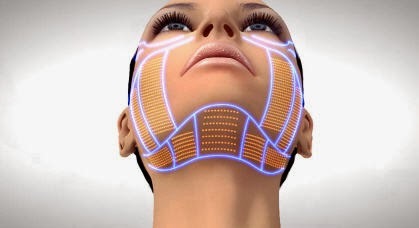 Lasers have been known to work on the skin from the outside. But in Ultherapy collagen is targeted, bypassing the surface layers of the skin. It is an inside out therapy, unlike others. The ultrasound energy is collaborated deep into the skin tissues. Ultherapy is very different from other skin treatments available in the market today. The same way as a doctor sees the internal organs by an ultrasound, the skin doctor in this case checks out the collagen layer of the skin. He clearly identifies the target areas and successfully deposits pockets of ultrasound energy there. This is the same layer which is targeted by plastic surgeons during a facelift. After an Ultherapy session is over, the body responds by sending a signal of reconditioning to the weary skin and stimulates fresh growth. As a result there is a gradual lifting and tightening of the skin, back to its younger or youthful stage. Both men and women with relatively loose skin are ideal candidates for this treatment. Loosening of skin generally starts from the forehead and carries on till the eye brows. Loose skin on the cheeks and neck can lead to a flat look of the mid cheek. A downward mouth or a jaw line that looks lost and all kinds of sagging can also be treated. Sophia is a leading expert in the field of plastic surgery. According him the field of surgery is very vast and holds the scope to accommodate newer ways to dealing with the skin for keeping it younger. His works have been published across 7 books, and more than 100 articles.